During my vacation I had the fortune to hit with the talented young Norwegian Karl Adrian Ringdal Noerstenaes and his Donnay Pro One Penta 97. I think I got enough time in with this racquet to make up my mind about it, so as per request, here is the Donnay Pro One Penta 97 Racquet Review. The Donnay Pro One Penta 97 is something so rare as an 16×19, 97 sq inch, low-weight and yet very flexible racquet (RA 57). You rarely see Donnay on the tennis courts these days. I was curious about their new line of racquets and their Hexacore technology, which is supposed to create increased comfort. I can really vouch for the comfort of these racquets in this Donnay Pro One Penta 97 Racquet review. The racquets I tested were strung with Luxilon 4G at 23/24 kg, a control-oriented option for such a flexible racquet. I could immediately feel the ball sink into the string bed, and if you are fan of flex and arm-friendly racquets this could be a great option for you. However, the power is something you need to bring on your own. But for a player like Karl, who besides coaching plays actively on the Futures tour, I can really see how this racquet fits. Some colorful and descriptive writing for a racquet info page! Talking about the specs of the Donnay Pro One Pentacore 16×19, Karl’s racquets were bumped in weight to about 335 grams strung, with around a 33 cm balance. Not too far from my own specs on the Soft Drives, but the Donnay Pro One with its smaller head and thinner beam is obviously more easy to swing. I have not played a sub 60 RA racquet in a while and it sure is an acquired taste. Actually I prefer a bit more even flex and a stiffness rating closer to 62 strung, but can still appreciate a flexy frame. If you like low-powered and flexible racquets but want more spin, I think this kind of frame will be hard to find! The flex is definitely pronounced, but with the specs that Karl uses, it does give you some power as long as you have the mechanics. Sadly, I do not have the technique that Karl has, which is really good (you will see his technique in the upcoming video review), so I cannot really use this racquet as well as he can. But if you do feel like you want an arm-friendly, yet flexible and spin-friendly alternative, this is definitely one of the best ones on the market. 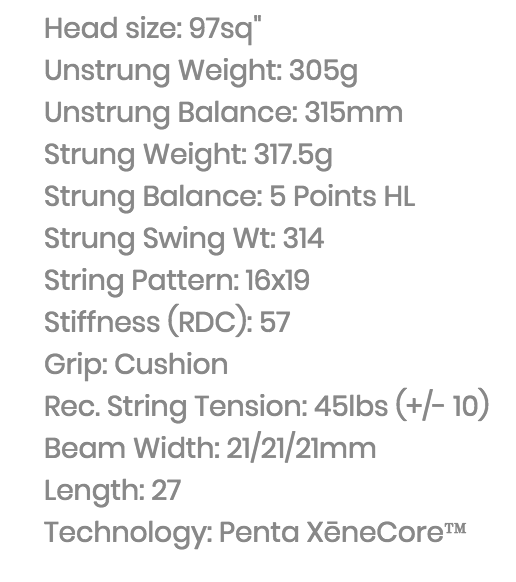 If you are a fan of the Wilson Pro Staff RF97A (read or watch my review) but have issues with the stiffness of the frame, this could be a good option to put lots of lead tape on and play with no comfort problems whatsoever. But you obviously need to enjoy more flexible racquets to play well with this frame, because the RF97A has a stiffer feel on impact. 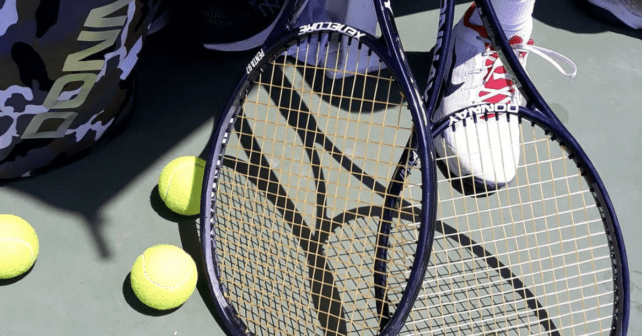 Donnay Pro One Penta 97 Racquet Review – For who? The flexible feel of the Donnay Pro One Penta 97 is definitely not for everyone. If you have not played with that kind of flex in the string bed before, it might require a break-in period and it might just not be your thing. But if you like that kind of performance and arm-friendliness from your racquet, this racquet could be a really good fit. I did find it demanding to go from the stiffer Babolats I have been hitting recently to this racquet at first, but once you get in the groove with a frame like this it can really benefit your game. I would say this is definitely a racquet suitable for more advanced players. There are similarities in feel to the Angell K7 Red (read my review), but I felt like the Angell has a little more free power and a slightly bigger sweet spot so it is a little easier to use. The Donnay offers a bit more control and a slightly lower launch angle. To summarize, it is a shame that Donnay racquets are not more easily available (as far as I can tell only through their website and with expensive shipping to Europe), because they are really high quality products. Kudos to them for daring to stick to low stiffness rating and urge the player to improve their technique to generate the power for themselves. After playing with this racquet (and with Karl) I realize there is so much I need to work on, but I try to see that as a positive thing. We all have our own little tennis journey ahead of us. What do you think of the specs of the Donnay Pro One Penta 97? Have you tried it or would you like to? Please comment below! How would you compare these Donnay with PT57A and Tecnifibre TFIGHT 315 ltd? I think the PT57A and Tfight 315 Ltd has slightly better control, but less spin. The feel is close, but personally I would go with the PT57A or Tfight 315 Ltd, since I prefer the feel a bit better there. The specs are something like the Prince Phantom 100 rackets. What’s the difference between them? I played the Prince Phantom 100 pro and ii is very arm friendly. Yes, they are both arm-friendly racquets. The Donnay Pro One Penta 97 offers slightly more spin and a more significant flex in the smaller head size. It is a matter of feel I would say. The sweet spot is bigger on the Prince Phantom Pro 100, but the Donnay moves faster through the air. Both good racquets for sure. I have thought about ordering a Donnay X Dual Gold 99 mostly because I enjoy the paint job. Do you know anything about the racket and how it plays? Hello. Love your reviews! Can you describe in order which one feels the most flexible? PT630, TFight 315 atp ltd 16m, donnay pro penta 97 16m? I have a prostock verdasco (dunlop pj) with ra 55. I loved the pt630 but was looking for a 16m string pattern. I came across the tfight315 and donnay. Which one feels the most flexible? Thanks! The Pro Penta 97 felt more flexible than the PT 630 even, possibly due to slightly bigger head size. It is also more flexible than the Tfight 315. That pro stock Verdasco is a nice stick! He really manages to murder the ball with a flexible racquet. Impressive. Thanks for the reply. The Verdasco racquets are from a batch of testing racquets made for him. I think it goes from option 1 to option K. I got a hand on the option H. For example, option 1 has a 59RA, while option H 55RA. I have a pair of TFight315 4 3/8. They arrived a couple of days ago. I still prefer the pro stock. If you are interested send me an email so I can send you the pricing etc. The donnay will arrive sometime. Customer service is not that great. They didnt send me the tracking number so I guess it will be more like an easter egg surprise. So I am hoping one of these will match pro stock (Donnay PP97 or Prince Phantom pro 100). Otherwise, will have to hunt for the pro stock pair! ugh. Yeah, I have heard about the infamous Donnay customer service. So if you don’t get with the Donnay or Phantom you would try to find a option H Verdasco stick? I will let you know if I hear of one.